This topic contains 26 replies, has 8 voices, and was last updated by airscapes 02/20/2019 at 9:27 am. The set consists of 4 stops 25mm, 16mm, 13mm and 7mm which can be used in any combination. The TPU is extremely flexible but also very hard to compress on axis due to the way the infill and shells walls are fabricated. This topic was modified 2 months, 3 weeks ago by airscapes. This topic was modified 2 months, 1 week ago by airscapes. I’ll try a set in black. Impressive idea, keep up the good work. I think having the bounce will be beneficial. I am happy to pay shipping or your cost? This reply was modified 2 months, 3 weeks ago by Jason. Jason, sent you a PM with my email address. airscapes, There are two reasons to employ paddle bumpers or stones stops, my preferred name. One reason is to cushion the stone as it bumps down against the ball arms. The other reason, which is why I started using use these stone stops, is to limit the travel and the range of motion of the sharpening paddles as they slide up and down the guide rods. I use both a lower stone stop and an upper stone stop that I lock in the position I need them along the guide rods. The stops are particularly helpful while employing an up-down-up-down scrubbing motion. The stops give me safe control over the stones motion so I can concentrate solely on the stones position and contact against the bevel and not need to also monitor the stones travel along the guide rods. I don’t want to allow the stones to slide down the guide rods, or be in a resting position, so the top of the stone is lower then the bevel. This would allow the stone abrasive to contact the knives side steel below the knife edge. This causes those unwanted scratches to the sides of the knives. For the same reason, if the stone is allowed to travel up above and off the knife’s edge, when the downward motion of the scrubbing is initiated, the stone can come down onto the knife edge and cause damage to the apex. This damage can be quite severe depending on how fast or aggressive the scrubbing motion is. The stone stops are particularly helpful when sharpening knives that are clamped in the vise in such a way that the edge is positioned higher then the top of the stone, as it’s resting down at the bottom of the guide rod. This situation is seen when sharpening larger, taller bladed knives, or when using the low angle adapter, (LAA), used to elevate the knife to allow you to achieve those low bevel angles settings, with-out the stones contacting the vise and jaws. Some of us have modified our sharpeners to allow us to achieve lower angle settings with addition of “riser blocks”, that elevates all clamped knives higher relative to the ball arms position. These sharpening scenarios sometimes call for the need to use longer guide rods. In these situation being able to limit the travel by setting the stone stops position to exactly match what I’m sharpening at the time, allows me to place all my attention on my sharpening technique without worrying about the stones position. That all make perfect sense and I did experience the stone below the bevel out a the end of the bread knife.. I did not think about the top stop, however I think these may grip the rods tight enough to work at both ends. Time will tell! Airscapes – sent you a PM. Thanks for the interest in these. I have 2 sets out in the mail and want to see how folks like them.. The Ninjaflex is rather expensive and I am not sure if the price I would need to charge to make these and mail them would be worth it to folks. I could make the same out of a hard plastic that would be much less costly I will have to see how the 2 members like them and if they think they are worth having. So at this time I can’t really give out any more free samples, initially I didn’t bother to check to see how much filament was used to make them as it was just for my self. Filament cost for a set is about $6, add time, electricity, shipping envelope and postage.. you up around $25 to make a few dollars. 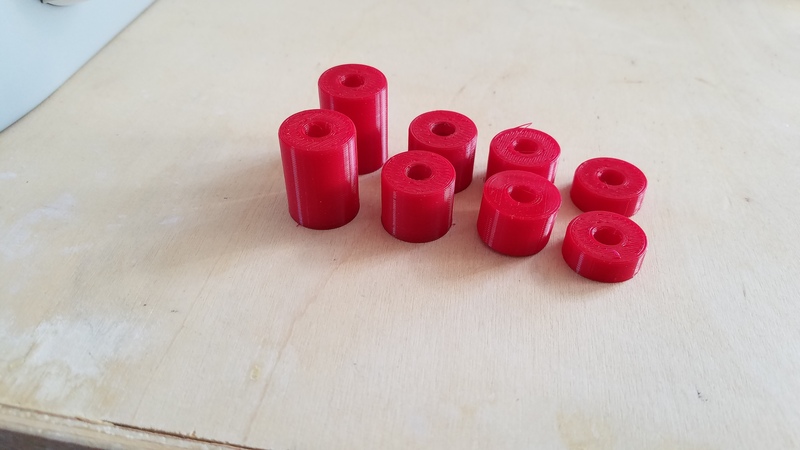 PETG or ABS would bring the material cost down to pennies but no bounce or tight fit without a set screw..
Just got my set in the mail. I have only been able to sharpen a small kitchen knife. I am brand new to the WE. I have the WE130 portable since XMas. Sharpened probably 2o knives. From my limited use, I really the bumps. They are adjustable so you can maximize the stroke of your stones. They reduce and soak up any stones that hit the bottom end stroke of the base of the rod with ease. Colors are black and blue I was sent and like them. I am very happy with this product. They are very tight which is a good thing, but will need 2 hands to install and/or adjust height. When I get a few more knives done, Ill post another update. I am glad you like them! I am not sure if all the different sizes are really needed or if 1, 1/2 and 1/4 inch would be sufficient. I just priced the 1 kilo spool of the Ninjaflex and it is much better price per gram in the larger amount. I had just gotten the sample pack of 50gram spools to try out. At $55 a Kilo I could probably produce these for about $10-15 a set. Please include in your next update if you think they are actually worth that. I notice that the sided of the paddle sometimes hit the side edge of the bumper so I probably will reduce the diameter from 19 to 18mm. The center hole could be made larger for easier fit on the rod but then would also not stay put if you wanted them part way up.. I would not mind getting a set in green. Sorry David, the cost me too much in material and time to do any more for free. I want to get feed back from both folks that I sent them to and find out if they are work making for the price I will have to charge.. probably between $10 and $15 which seem like a lot for something you can make from any number of hardware store items. <!–more–>I understand and did not expect them for free. Airscapes, <!–more–>I understand and did not expect them for free. I’ve received mine but have not had a chance to use them yet. I will post a review once I do. And thanks again for sharing.